When I'm not thinking about CAKE, I'm thinking about COOKIES! Well, Baker Beth has managed to combine both in this deliciously touching cookie o' the month. It's probably best I stop writing and just let you take a gander and these beauties. Beth, thank you so much! They are perfect. I've baked my way through Angelo's "my favorite things" page on angelohome.com: cherries, red wine, "The Godfather," and Baxter have been referenced in cookies over the past couple years. Chicago is still under consideration. I think Levis aren't going to make the cut. But for some time, I've been mulling how to interpret Curious George into a cookie, and this month is the month. I admire Angelo's admiration of George's philosophy. And I admire Angelo. And he's having a birthday — in mere days! 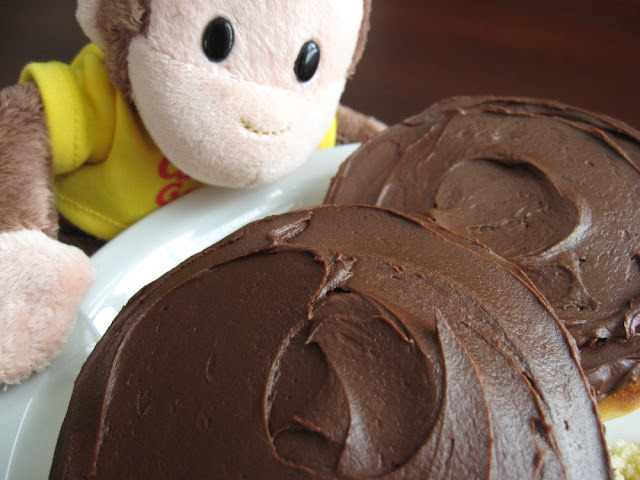 — so what better time to bake a Curious George cookie? The trick, though, was trying to identify the cookie essence of an illustrated monkey in a children's book. The happiest of birthdays to you, Angelo, my friend. May it be filled with much love, many treats, and an entire bunch of balloons. Yummy, you reinvented the famous Baltimore Berger cookie! And I had no idea! Thanks for the education.